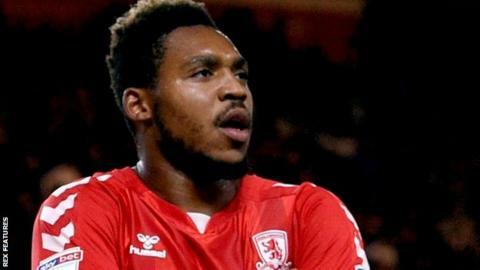 Brit Assombalonga has now netted four times in the Championship for Middlesbrough this season. Middlesbrough missed a chance to go to the top of the Championship table after being held away to Hull City. Brit Assombalonga opened the scoring for Boro by heading in Jonny Howson's deep cross at the far post six minutes into the second half. But Hull equalised through Jarrod Bowen's penalty 18 minutes later after Chris Martin was fouled in the Middlesbrough penalty area. Tony Pulis' side thought they had regained the lead on 89 minutes but Howson's downward header from Stuart Downing's cross was superbly saved from City keeper David Marshall. The result means Boro now drop to third in the table on goal difference while the Tigers climb out of the bottom three. Middlesbrough boss Pulis made 10 changes to the side that beat Preston in the League Cup in midweek, while Nigel Adkins' Hull were looking to bounce back from a 3-0 loss to Reading in their last league outing. Boro had the best chance of the first-half as Assombalonga's curling effort went narrowly wide on 20 minutes, but Hull's Markus Henrikson also came close, shooting off target after a quick free-kick. The promotion chasers could have been 2-0 up moments after their first goal as Howson and Assombalonga combined again but the latter was denied by City keeper Marshall. As both teams pushed for a winner Henrikson nearly gave Hull all three points eight minutes from time after a good run into the Middlesbrough penalty area but his shot was easily saved by goalkeeper Darren Randolph. "We competed very well today because we knew this would be a really challenging fixture." (On his side's penalty) "Their defender has made a challenge and the referee had a decision to make. "Jarred Bowen has finished it well and it was a point that I think we thoroughly deserved." "We need to get more goals, we have to take the chances in the final third and be more clinical. "You've got to be 100 per cent every game, but today I didn't think we controlled the ball enough. We had some great chances. Match ends, Hull City 1, Middlesbrough 1. Second Half ends, Hull City 1, Middlesbrough 1. Attempt missed. Martin Braithwaite (Middlesbrough) header from the right side of the six yard box is too high. Assisted by Stewart Downing with a cross following a corner. Corner, Middlesbrough. Conceded by Tommy Elphick. Hand ball by Stewart Downing (Middlesbrough). Corner, Middlesbrough. Conceded by David Marshall. Attempt saved. Jonny Howson (Middlesbrough) header from the centre of the box is saved in the bottom left corner. Assisted by Stewart Downing with a cross. Attempt saved. George Friend (Middlesbrough) header from the left side of the box is saved in the centre of the goal. Assisted by Stewart Downing with a cross. Attempt missed. Aden Flint (Middlesbrough) header from the centre of the box misses to the right. Assisted by George Friend with a cross. Attempt saved. Markus Henriksen (Hull City) right footed shot from a difficult angle on the right is saved in the centre of the goal. Assisted by Reece Burke. Aden Flint (Middlesbrough) is shown the yellow card for a bad foul. Substitution, Middlesbrough. Martin Braithwaite replaces Jordan Hugill. Substitution, Hull City. Fraizer Campbell replaces Kamil Grosicki. Substitution, Middlesbrough. Stewart Downing replaces Sam McQueen. Attempt missed. Jarrod Bowen (Hull City) left footed shot from outside the box is close, but misses the top left corner. Assisted by Reece Burke. Goal! Hull City 1, Middlesbrough 1. Jarrod Bowen (Hull City) converts the penalty with a left footed shot to the bottom left corner. Penalty Hull City. Chris Martin draws a foul in the penalty area. Penalty conceded by Daniel Ayala (Middlesbrough) after a foul in the penalty area. Chris Martin (Hull City) is shown the yellow card for dangerous play. Dangerous play by Chris Martin (Hull City). Attempt saved. Kamil Grosicki (Hull City) right footed shot from outside the box is saved in the bottom left corner. Jarrod Bowen (Hull City) wins a free kick in the attacking half. Aden Flint (Middlesbrough) hits the bar with a header from the centre of the box. Assisted by Ryan Shotton. Attempt blocked. Jackson Irvine (Hull City) right footed shot from outside the box is blocked. Assisted by Markus Henriksen. Attempt blocked. Jarrod Bowen (Hull City) left footed shot from outside the box is blocked. Assisted by Jackson Irvine. Kamil Grosicki (Hull City) wins a free kick in the defensive half. Corner, Hull City. Conceded by Daniel Ayala.